January 3, 2010 Dan O.
Coen Brothers can basically do no wrong. Ex-cop Edwina “Ed” McDonnough (Holly Hunter) and her ex-con husband, H.I. (Nicolas Cage), are devastated when they learn they can’t have children. Not to worry: They reckon they’ll just “borrow” one of furniture magnate Nathan Arizona’s (Trey Wilson) new quintuplets. Now this film was the Coen Brothers next hit after Blood Simple. That was very slow paced and spare, however with this, it’s upbeat, funny, and overall some of the better work that they have done. The story is so off-the-wall. It is all just so goofy, to its characters, its story even to its look at points. The film pokes fun at heart of America citizens which didn’t seem in good taste, but then soon starts to redeem itself due to some big laughs that make you just listen to the jokes rather than the visuals or story. However their were some slow patches, and parts that didn’t make sense. Such as Cage always dreams of a crazy biker who was always killing things, and somehow he ended up turning real, and finding out how to solve one case that I can’t really tell you. For me this was really confusing but at the same time, I just ignored it due to the humor. The Coen Brothers really do know how to just film a movie with their realistic as hell camera work. The film has many chases and action, but the camera never loses pace with its action and you always feel like your on the ride of a lifetime with some of these shots. Also, the film is really great to look at with all its vibrant colors, and such make this film a lot more colorful. The performances here are some of the funniest and quirkiest made from the stars. Nic Cage plays a goofy crook, who always has these hilarious insights on life, that are just so dumb, but at the same time are just great and actually kind of smart if you think about it. Holly Hunter does even a better job as Ed the ex-cop, and the one thing that these two have in common despite being on two opposite sides of the law, they both have very good chemistry together and it rarely ever seems forced. The film does a great job at leaving us with a thoughtful message with a powerful scene. It tells how some people fit into this crazy world, and how others sometimes cannot, and maybe, just maybe, we shouldn’t be too quick to judge either group. 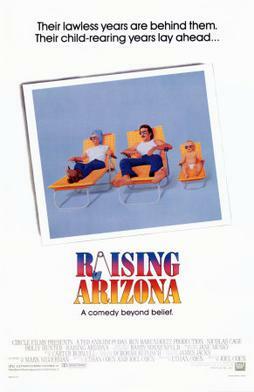 Consensus: Raising Arizona has some rough patches, but is revived with its hilarious and at the same time quirky humor, unusual characters with wonderful performances, and a powerful message to leave us off on this crazy ride straight from the Coen’s.